That's all from me folks. Off the Ball is still running and the BBC Alba broadcast of St Mirren's win at Livingston is just about to start. We'll be back tomorrow for Hibs v Celtic. Kilmarnock manager Steve Clarke tells Sportsound that is the "worst refereeing performance I’ve ever seen in my career". "Aberdeen came to do a specific job," he says. "I think they were looking to score off set plays, they had a lot of big boys in their team and that’s what they did do. "You’ve got to look at all the incidents in isolation. Cosgrove could have been off. That’s why Derek took him off at half time. If Derek was the referee he would have sent his own player off. Kirk Broadfoot made a genuine attempt to go for the ball. He went with no violence, no malice, it was a genuine attempt to play the ball. We’ll appeal that one. "Stuart Findlay was a second yellow. I’ve no problem with that. "The Rory MacKenzie one the referee didn’t see. So I’m assuming the guy that was standing next to me (fourth official), 50 yards away from the incident, gave it. From where I was standing you couldn’t see what happened. Maybe they have to explain that one as well." Some strong words coming up from Rugby Park boss Steve Clarke, who is not happy with referee Steven McLean's performance. St Mirren manager Oran Kearney is not getting carried away with their win and admits his side were punished for the “relief or mini celebration" after falling behind soon after Livi captain Craig Halkett was sent off. “But I have to give them credit for the character that they’ve shown, to go ahead on days like this can be tough to see the games out but to come from behind and the manner we did it speaks volumes for the group," he says. "Paul McGinn’s goal is the most crucial of the three as it gets us back into the game. "Danny Mullen has that in him - that flesh of quality - it was a heck of a goal. Simeon Jackson’s is one people will forget quickly, it’s a striker’s goal but a crucial one to seal it off. "We’ve been in a good place for six weeks and really have gained momentum and built on performances and accumulated points so we want to keep that rolling. "Come Monday, it’ll be all systems go for next week again." Dundee manager Jim McIntyre tells Sportsound he was disappointed with his team's performance today. "In the first half we got into good areas but the final ball was really lacking," he says. "We got into areas and never worked their goalkeeper. St Johnstone fed off that and punished us. "There’s going to be nerves and pressure but you’ve got to handle it. We’ve let the travelling support down. "We’re going to have to do something we’ve not done all season. We need to win all four games now. "We’re getting punished because we’re not doing our jobs, picking up and stopping crosses. We got done on the second goal by that. "We’ve still got an opportunity (to avoid relegation) but it’s a slim one." Time for Off the Ball part II now, you can listen via the tabs at the top of the page. You can also watch St Mirren's win at Livingston 'as live' courtesy of our friends at BBC Alba. That transmission starts at 18:00. Livingston boss Gary Holt tells BBC Scotland he felt everything hinged on captain Craig Halkett's sending off. "That's always something that changes or has an impact on the game, and it certainly didn’t help so early in the game on a red hot day," he says. "I'll need to look at it again. "To a man I thought our guys were excellent, the shift they put in was really good and we had chances with 10 men and, if it was 11 v 11, I think we’d have won the game. But take nothing away from St Mirren, fair play to them. "We countered them well in the first half, but it’s always going to be tough when at half time they changed it and brought extra attackers on and made the game bigger. But I thought we were comfortable. The second takes the stuffing out of you, especially when you’ve played so long and I feel for the lads because they put in a shift but we just have to take it on the chin." Aberdeen manager Derek McInnes tells BBC Sportsound he is pleased with his team’s battling performance today. "It was a tough game, very competitive," he says. "It’s good we overcame a lot of challenges and got the job done. There were very few opportunities, it was more about fighting your corner. We got the all important goal and we go back to Aberdeen pleased with our work. "I’ve never seen Rugby park getting behind their team like that in such a vociferous way; the game had that cup tie feel. "Although we had a lot of youngsters in the team our experience played its part." Ross County are almost there, but not quite. The Dingwall side will secure the title and promotion back to the Premiership at the first time of asking if they pick up anything from next Friday's home game against Queen of the South. You can watch that game live on BBC Scotland. 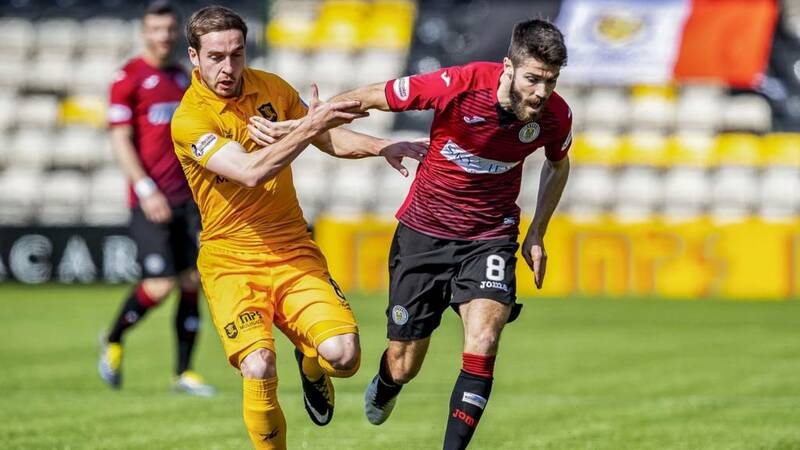 Partick Thistle, Morton and Queen of the South picked up good wins today and the Jags are in action again on Tuesday against Ayr United. Very nervous times for Falkirk, with just two games remaining. Hamilton manager Brian Rice: "I thought we started well and were on top. Then a poor goal from our point of view set us back a bit. It knocked our confidence. Second half, the boys were excellent, we pressed them higher up the pitch, and I think we deserved our point." Quote Message: It was a poor performance from referee Steven McLean. I understand there was a lot to play for but the discipline really went towards the end of the game. A lot of that was down to the referee. From an Aberdeen point of view, they got the points but there was hardly any football played. It was a poor performance from referee Steven McLean. I understand there was a lot to play for but the discipline really went towards the end of the game. A lot of that was down to the referee. From an Aberdeen point of view, they got the points but there was hardly any football played. Aberdeen are up to third place after that tempestuous win at Rugby Park, while St Mirren move six points clear of Dundee at the bottom. Rangers' lunchtime win at Tynecastle cuts Celtic's lead to eight points. The leaders visit Easter Road tomorrow. Kilmarnock finish with eight men as Aberdeen leapfrog the hosts into third place with four league matches remaining. The only goal in a bad-tempered match came from a corner, with Scott McKenna nodding home. A dominant second half display against 10 men from St Mirren gives the travelling support plenty to sing about in the spring sunshine. Second-half goals from Danny Mullen and Simeon Jackson help lift the Paisley side six points clear of bottom side Dundee. Kilmarnock are reduced to eight men as Rory McKenzie lashes out off the ball at Scott McKenna after thinking he should have had a foul against the Aberdeen defender. Home manager Steve Clarke storms down the tunnel after shaking the hand of counterpart Derek McInnes. Accies pick up a precious point thanks to that late Marios Ogboe goal - and they could have nicked a win but for a miraculous save from Mark Gillespie.